Cancer is one of those rare topics that can be extremely difficult to pull off as the main focus of your film. Some films handle it well, such as Terms of Endearment or the underrated Now Is Good, but mostly it can so easily be used as a mere manipulation device to get audiences crying into their popcorn. We hate to sound so cynical about it, but more often than not the topic is used more to tug at heartstrings than really analyse it in detail. This is why Miss You Already is such a fascinating case, because it combines both the cynical melodrama and also the innovative effects of having cancer that one would expect from a film like this. What it amounts to is a film that’s neither the best example, nor the worst; it is simply its own thing. In this instance, the featured disease is breast cancer, which is diagnosed toward wild girl-turned-doting mother Milly (Toni Collette) by the time the film hits the 10-minute mark. From there, Milly and her lifelong American friend Jess (Drew Barrymore) simply try to live with the complications of the diagnosis, from chemotherapy to an eventual life-altering decision. That’s more or less the crux of the film, with additional subplots that see Jess eagerly trying for a baby with partner Jago (Paddy Considine) or Milly’s former rocker husband Kit (Dominic Cooper) gradually growing apart from his ill wife giving way to what it really wants to focus on, that being the effects and consequences of having this certain illness. Whenever the film decides it does want to be a straightforward drama around the subject, then it can be at times rather innovative and, for lack of a less condescending term, brave. Breast cancer is a serious issue that is rarely depicted so graphically in modern cinema, let alone mainstream cinema, but this is a film where the effects of chemotherapy and – more crucially – a later double mastectomy operation are not sugar-coated to fit around a more upbeat tone, and the film should in some ways be applauded for going the extra mile in depicting it so honestly and without boundaries (for the most part, anyway; it’s still a 12A film) which gives it the opportunity to possibly connect with audience members who may have indeed suffered through similar ordeals. Collette, as well, is a strong anchor that pulls things along nicely, and gives us a more complicated cancer sufferer than we’re used to seeing in films like it through her committed and emotional performance. However, this is also a film where her character, after going through the aforementioned operation, is referred to as “Frankentits”. That should tell you everything you need to know about the unbalanced nature of the film. Outside of the main cancer plot, everything else is just mediocre and not as captivating or even interesting. Barrymore is stuck with a bland character with a bland story arc, and while other actors like Considine, Cooper and Jacqueline Bisset (the latter as Milly’s egocentric actress mother) have their moments, none of them are strong enough to warrant mention. Crucially, however, the core relationship between Milly and Jess fails to entirely convince; despite a good chemistry between Collette and Barrymore, theirs feels like a friendship that only seems to exist in the movies as opposed to the real-life drama it wants to portray. A spontaneous trip to the Moors in a London cab, with both women laughing hysterically along the way and singing along to R.E.M’s “Losing My Religion”, can’t help but feel contrived, no matter how well intentioned; and for the most part, there is a lack of real conflict that does not add to any of the drama that is already there, and whatever conflict there is is resolved not long afterwards. It’s also worth noting that this is one of the rare films that is directed, written by, and mostly starring women; an all-too rare occurrence that sadly needs to be fixed sooner rather than later. Catherine Hardwicke, director of Thirteen and the first Twilight movie, certainly shows a strong vision here – even if some close-up shots are a little too invasive of the actors’ faces – and writer Morwenna Banks knows how to pace a film with a few amusing anecdotes thrown in for good measure. 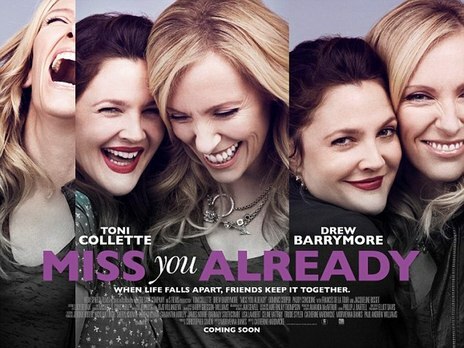 It would certainly be nice if more chances were given to female directors and writers to tell their stories on screen, and though Miss You Already isn’t the best of the lot, it’s a fine but flawed film that shows that there are good female storytellers out there; they just need to be given the opportunity. Miss You Already handles its difficult subject matter fairly well, refreshingly not willing to shy away from its more serious consequences, but everything else surrounding it fails to meet up to its standards.